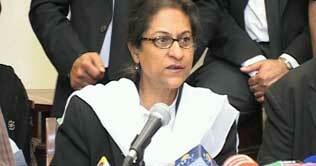 President of Supreme Court Bar Association Ms Asma Jahangir says on call of Pakistan Bar Council legal fraternity will observe countrywide black day and complete strike on May 23, 2011 to protest against growing targeted killings of members of legal fraternity. Speaking at Meet the Press program at Karachi Press Club, she said all bar associations will observe black day, black flags hoisted, lawyers completely boycott courts proceedings and stage protest demonstrations. General body meetings will be held to chalk out future course of action. She stated targeted killings of lawyers and citizens by criminals or law enforcers were on rise in all provinces. “The mechanism to protect human rights exists no where in country. People are begging for justice.” The incidents of lawyers kidnapping of lawyers has become routine and no action is being taken, rarely culprits are arrested, but they also go scot-free due to state machinery’s inefficiency, she stated. She said growing VVIP security and protocol culture of rulers was big joke with country and its people, who were badly suffering due to deteriorating law, order situation. SCBA President observed present democratic system had failed to deliver to masses according to their aspirations. “We waged struggle for strengthening democratic system and institutions. Ms Asma expressed concern over functioning of judiciary, saying junior judges were being promoted, lawyers not considered for appointment as judges to high courts. Ms Asma Jahangir said in recent meetings code of conduct of bar associations was also discussed and it needs improvement which must be brought about. Four people, including two brothers, were killed amid the incidents of violence in Karachi on Saturday. According to police, unidentified men shot at a car in Musharraf Colony that killed two brothers Nazir Abbas and Altaf Hussain. Police sent their dead bodies to Karachi Civil Hospital for autopsy. Both brothers were lawyers, killed in firing by unidentified gunmen. Following the incident, the lawyers protested and boycotted routine activities in the City Courts. Police told the media that the slain brothers belonged to Chakwal and had been living in Karachi for last several years.